Always having been a person interested in staying fit and eating well, I lived my 20’s and my early 30’s working out – hard – in a gym, and eating what I thought was a perfect diet of a lot of whole grains, fruit and some vegetables. I had a stress-filled job that kept me feeling tired and unfulfilled. And I was often tired midday, always seemed to crave something or was hungry right after eating. And like most, I chalked it up to it being normal. Most people I knew had mid-day crashes of energy and were hungry often. Most people I knew had stress at work. So I continued to work out, count calories, and feed my body bursts of sugar masked as yogurt or a granola bar to get me through the day. My weight fluctuated from time to time, as did my energy. And my stress levels seemed to coincide with these fluctuations as well. In 2010 at the ripe old age of 40, after years of trying to get pregnant and realizing how unwell I was feeling overall, I decided to dig deeper to find the root cause of what was going on. I saw a Functional Medicine Practitioner who tested me for and diagnosed me with severe Non Celiac Gluten Sensitivity. This diagnosis was in fact a bright spot because it answered a lot of what was going wrong and had been for most of my life – anemia, hypoglycemia, osteoarthritis, fatigue, aching joints, an irritated gut, and a seaming inability to get pregnant. Over the course of the next 3 years I not only went gluten free, I looked into, read about and embraced living Paleo. It started with diet – eating whole foods void of gluten, dairy, refined sugar, and grains – and morphed into a more holistic way of being well – learning about all the ways we find balance and wellness in our life that have nothing to do with food, but rather the nourishment we get from good sleep, adequate movement and meaningful relationships. Embracing this lifestyle gave me a new lease on life. It was the first time in what felt like forever that I was pain free, hunger free, and feeling full of energy. And at the age of 43, I did get pregnant! It resulted in a miscarriage but the experience sent a clear message to my body that it can do it, that I am healthy and strong enough to get pregnant. In fact, it made me realize that given half the chance, the body knows how to heal itself. Something we aren’t really taught, but something that really resonated with me. Today, my blood sugar and pressure are low and in control. I have no back pain – and haven’t since one month into being gluten free. My energy is sustained through the day. I do workouts that are harder than those I did in my 20’s. And I have a better, more holistic view of health and wellness. My quest to feel better in my day-to-day physically and mentally not only led me to feeling incredibly healthy and well, it led me to an evolution in my career as well. I was learning so much about myself and was so sure of how beneficial my new lifestyle was that I decided to learn more about how I could help others believe in their ability to be well. I know there are no coincidences in life. There was a reason I was going through a major lifestyle change in order to heal my body, at the same time I was going back to school to get certified as a holistic health coach. 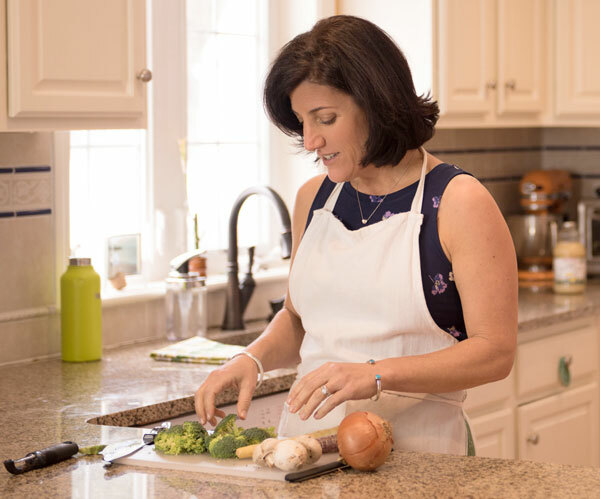 I wanted to learn about ways to more fully help people embrace the necessary changes to attain wellness like I did – not just through what they ate but how they lived. It was also no coincidence how much organization for me – in my work, my own space and with my thoughts – played a major role in going through this drastic change successfully. Everything came full circle, and beautifully into focus at that time. I could see quite clearly the connection between attaining wellness and organization. I lived it, and could see how the two fed each other. And today, I am so happy to be able to help others become more holistically well through organization. My wellness philosophy is simple: Wellness is a state of mind that is cultivated and created by how we choose to live life. And what we choose to have in our life. I believe when we are conscious about what we own and think, move and sleep adequately, create meaningful relationships and work, and eat so we are nourished, we will have the physical energy, and mental clarity to make positive lifestyle choices, and create a life we truly love. Francesca made the foundation steps of my academic journey manageable and we set specific, realistic goals each step of the way. She held my hand through the scariest of times in this journey and gave me the support I needed to step into my truth. She is generous in spirit and wisdom to help clients walk the path towards their highest potential. The day you left my reorganized house I absolutely felt lighter and more in control of my space and my life. I will never return to the chaos of before because now I have systems in place to help me stay organized. You have been the guiding influence for this year of “living life lite” for my family. I can’t thank you enough for all of the inspiration and coaching on living verri well. Francesca brings a positive energy and boundless enthusiasm to her work. I intended to put my home on the market, but the chaos of our accumulated stuff made that impossible. After several sessions with Francesca, I couldn’t believe the progress! Francesca, thank you for making me whole again!!! You showed up at every meeting ready to guide me on this empowering journey with passion, wisdom, patience and thoughtfulness. It’s still unbelievable how much progress our family has made. Francesca Verri is exactly what I needed to begin to view my life differently and make positive changes in the right direction. ! The process of streamlining my life by letting go of what doesn’t work and organizing what does is making me see all the possibilities ahead. I went to Francesca because I was living in constant chronic pain and was at my wit’s end. My body responded very quickly to the diet and lifestyle changes she recommended. I’ve noticed a ton of positive changes: steady weight loss, clearer skin, no pain, no diabetes, normal blood pressure readings, better digestion. I can’t say enough of what this has done for me! To say that Francesca saved my life would be understating the fact that she added years to my life. By following Francesca’s instructions, I am on my way to a cleaner, healthier life.. The changes have been dramatic. I feel amazing, mentally and physically. Francesca Verri saved my business! My systems were failing; I couldn’t get caught up with clearing the papers – they were everywhere; and I didn’t know where to start in getting organized. She worked side by side with me to organize my office and provided me with valuable tips and skills on staying organized so the systems we set up are still running, still efficient and have increased my productivity 10-fold! Francesca taught me how to think differently, and helped me change years of unproductive habits — all with compassion, kindness and good humor. I started out wanting to gain space in my home, but what I really gained was space in my brain. Now I can use my mind to think about the things that really matter. Without Francesca’s compassion, understanding, motivation and professionalism, I would still be sitting in the middle of my floor clueless as to how to help my business and myself. What she does for you, your business, your family, or your personal life, is nothing short of amazing.